Essilor offers a multitude of rich career paths, often with an international scope, which allow new comers the opportunity to take up great professional challenges. Internal mobility is actively promoted so that our talented employees are able to develop new skills and grow. Tempted to join us? 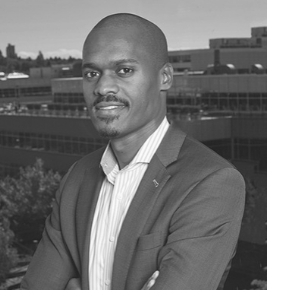 Why not find out more from Cheick Soumaré, who joined the Group as Chief People Officer at Clearly, one of the world’s leading online eyewear retailers acquired by Essilor in 2014. HOW DID YOU COME TO JOIN THE ESSILOR GROUP? I was drawn to Essilor for its Mission; it speaks to me particularly because I have lived in countries where access to medical services is not a given. I had to leave Angola as a child at the time of civil war in 1997 and went to a French-speaking school in South Africa. Later, I studied Economics and Management in Paris before doing a Masters in Human Resources. I moved to Houston, for personal reasons, I was motivated to live in Canada. When I saw Essilor had activities in Canada, I started putting out feelers and soon applied for the position at Clearly in Vancouver. So, here I am! It feels great to be working for a company with such purpose – helping to improve lives by improving sight. Having previously worked in industrial companies the culture is very different here. Clearly feels like a young, fresh, dynamic, technology company and has such positive energy! We are around 280 people, based mainly in Vancouver, but also in Sydney, US and Japan. The majority of our team is customer facing – we call them our “Vision ambassadors”! Everyone is passionate about the brand and what they do. WHAT ARE THE GOALS YOU HOPE TO ACHIEVE? I definitely want to make sure that the Mission is at the heart of everything we do. I also want to help strengthen interactions within Essilor and am keen to leverage some of our formalised HR tools to create efficiencies. I aim to share the message to people who are thinking of joining the Group that it is respectful of different identities and has a great value proposition. WHAT ADVICE WOULD YOU GIVE TO ANYONE WANTING TO JOIN YOUR DEPARTMENT OR ESSILOR? Being sociable is part of our DNA so I would say you definitely have to be able to connect with people and above all – have fun! That applies to the rest of the Clearly teams also!